Arduino Relay Shield is an key element when you need to give actions to your projects. The BMini is the perfect match for that. 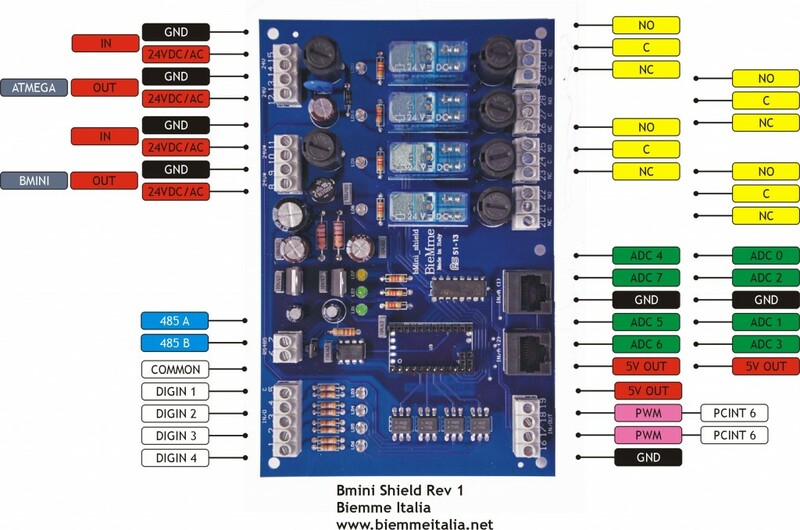 The BMini is an Arduino relay shield featured in the BieMme Store a couple of month ago. I think it is a great product and I’m very excited to tell you more about it. Basically, it is a Relay Shield for Mini 05, Ethernet and UNO boards, specifically designed for home and industrial automation. You upload your sketch in the Arduino board, plug it in the BMini… that’s it! In order to let the Bmini shield to leverage the power of the ATmega328 MCU, just plug an Arduino Mini 05 in the MCU socket. If you need to communicate with other Bmini shields, from a PLC or other devices, use the RS485 bus and the freely available modbus libraries. Check them in the wiki for code examples. Modbus and RS485 are not the only ways to communicate with other devices. Ethernet interface is also supported by the BMini Arduino Relay shield. Instead of using a Mini 05, you can plug an Arduino Ethernet Board transforming the Bmini into a lightweight TCP server. This is simply achieved by using a socket converter that I’m going to release on the following weeks. In the next week post, I’ll present a project based on a complex network of Bmini shields interacting each others. This entry was posted in arduino and tagged bmini, ethernet, relay, rs485 by biemadmin2012. Bookmark the permalink.